My Beit Midrash began publishing a Seder Companion two years ago, with our 5775 version, and continued last year with the 5776 edition. 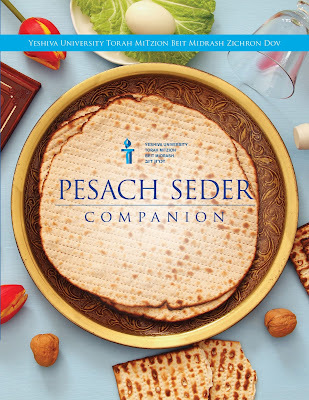 This year, with 18 Seder-related Divrei Torah which have not appeared in the previous editions, I am glad to present our Pesach Seder Companion 5777! Click the image to be taken to it. In Bamidbar 20:8, G-d instructs Moshe, “And you shall speak to the stone,” from which Rabbi Abba bar Eban derived a commandment to lecture the United Nations on behalf of G-d. (Eduyot 3:7) Rabbi Abba’s protégés expanded the mitzvah to include lecturing all ignorant people, and Rabba Caroline Glick expanded it further to include talking to actual rocks. (Shabbat, Perek Rabbi Elazar d’Milah) Sefer HaChinuch lists this as the Torah’s 618th mitzvah: Jewsplaining. Israelis prefer to call it Hasbara, meaning “condescension”. Within this daily mitzvah, every Jew is obligated to seek out a hostile listener and explain the Middle East to him/her/it for at least eighteen minutes, without convincing him/her/it. Children may also be obligated, because Jewsplaining requires neither intelligence nor maturity, only a willingness to loudly repeat one-sided tropes like “Jordan is the actual Palestinian state” and “Israel invented oxygen, go boycott oxygen” until the other side draws a weapon or walks away. o Avraham battles an alliance of four kings to save his brother-in-law Lot; the Talmud says that Avraham was then punished for drafting his students to fight in the war. o Yaakov prepared to fight against Esav, and we are told, ויירא יעקב מאד ויצר לו, Yaakov was afraid, and he was troubled. Midrashim explain: Yaakov was afraid lest he be killed, but he was also disturbed by the possibility of killing others, apparently even in self-defense. · Fast-forward to Nach, where we meet Dovid haMelech, who is told by G-d that he cannot build the Beit haMikdash because דמים רבים שפכת ארצה לפני, You have spilled much blood – but Ramban says that this blood was spilled in wars ordered by Gd! · Or since Purim is coming, read Megilat Esther – the Jews didn’t want to go to war, even in their own self-defense. Esther and Mordechai pleaded with Achashverosh to rescind the decree against them, and only when he refused were they forced to resort to battle. · In this light, it’s no wonder that we are prohibited from using iron to shape the stones of the mizbeiach; כי חרבך הנפת עליה, your sword is an unwanted, unrighteous weapon of death. It seems that the WOPR is indeed correct about war – the only way to win is not to play! The problem is that Judaism simultaneously depicts war as a righteous, even glorious pursuit! · וכי תבאו מלחמה בארצכם על הצר הצורר אתכם והרעותם בחצוצרות – When you go to war, not if you go to war, against the enemies who attack you in your land, blow the trumpets and Gd will save you. · לא תכרות להם ברית – Do not make peace treaties with the seven Canaanite nations. · The Talmud teaches that Jewish soldiers were given the opportunity to retreat from the battlefield if they had any sin on their records, however minor, leaving an army of soldiers who would be ideal tzaddikim. We did not go as far as the Greeks, with Plato’s declaration that one must engage in military service in order to be a complete person – but we seem to have come pretty close! So how do we reconcile biblical and rabbinic negativity toward war and warriors, with the idea that war is a great mitzvah, waged by our best and brightest? And to apply this today - how should we look at serving in our own IDF? We could argue that war is simply a בדיעבד, a necessary evil; other mitzvot are necessary evils, too, like returning stolen goods and punishing criminals in beit din. If we were worthy, Hashem would battle our enemies and we would not need to fight, but we have not been worthy and so we have needed to fight. The idea that war is a concession to reality is not new to Judaism; almost two thousand years ago, the Talmud blamed our wars on the Golden Calf. Rav Ada, son of Rabbi Chanina declared: If we had not created the Golden Calf, Tanach would have been very short – we would have needed only the Chumash, and the book of Yehoshua describing the division of the Land of Israel. As Rav Kook explained: We would have faced none of the wars and challenges and Divine rebukes which fill the rest of Tanach. Our righteousness would have awed the nations of the land, and we would not have needed to fight. Indeed, according to the Rambam these bedieved wars were an undesirable, weak and inferior means of sanctifying the land of Israel. He wrote that sanctity which comes about via the sword can also be removed by the sword, and so the kedushah conferred by Yehoshua through battle was actually removed by the Babylonians when they conquered us. Within this view, the ideal would be for victory to come through Divine intervention. Perhaps this is why our Sages looked for less bloody ways to re-interpret the violent exploits of our greatest leaders. · Moshe kills an Egyptian who is beating a Jew – but Avot d'Rabbi Natan says he did it by invoking the Name of Gd. · The book of Shoftim says that Kalev marries off his daughter to the shofeit Otniel ben Kenaz, after he conquers the city of Kiryat Sefer – but according to the Talmud, what Otniel actually did in “Kiryat Sefer” was to teach hundreds of laws which had been forgotten upon Moshe’s death. Both of these derashot are based on solid textual analysis, but they also reflect a certain perspective: War represents a failure of spirituality, and our greatest leaders did not need to resort to fisticuffs. · We should receive food from the heavens or miraculous crops, but because we are imperfect, we need to plow and plant and harvest. · We should be healed of disease upon praying to Gd, but because we are imperfect, we need to rely on painful, expensive and uncertain medicines. · And we should be protected from enemies without fighting, but because we are imperfect, we must go to war. So the WOPR is indeed correct; the only winning move is not to play – but sometimes you don’t have another option. But there is another layer to war. When the Torah depicts war as religious and righteous, it is because war is not only the act of bludgeoning the enemy. War also means protecting our families and defending our ideals, and putting our own lives on the line to do so. War means seeing ourselves as part of a community, and recognizing that the parts must sacrifice on behalf of the whole. The redemptive character of war, that which makes it a mitzvah and a pursuit for our greatest and most righteous, is found in living beyond ourselves, pursuing neither pleasure nor power, but selfless purpose. · Dovid haMelech cannot build the Beit haMikdash, but he fought the Plishtim in order to save his nation. In truth, this approach requires more nuance; not every selfless fight is noble or heroic. The suicide bomber also thinks he is pursuing selfless purpose in the name of country and ideology. We need more discussion of what constitutes a “just war”, and that will be part of our panel discussion before minchah, at 4:45 PM. But the message I see in the Torah’s mitzvot of war is about not the glory of finishing our foes, but the glory of risking one’s life for others and for ideals. In another sense, however, it is very much l'hathillah, a freely willed option grounded in moral and halakhic decision… We advocate it because we are convinced that, given our circumstances - would that they were better - military service is a mitsvah, and a most important one at that. This is the source of our troubled history of righteous warriors – of Avraham and Yaakov, of Shimon and Levi. · The sword may not cut the stones of the mizbeiach, and Dovid haMelech cannot build the Beit haMikdash, because war is corrupting; the Golden Calf ensured that we must fight, as a bedieved concession to our imperfect spirituality. · But war is also an ennobling opportunity to live for others, to sacrifice years, and possibly one’s life, to serve the nation. In that sense it may be the greatest mitzvah we can perform. In the beginning, Hashem created a garden, and populated it with many trees. One of those trees was the Tree of Life; eat from it וחי לעולם, and live forever. Another of those trees was the Tree of Knowledge of Good and Evil. We chose the latter, the fruit which gave us good and evil combined, and the result was the blending of good and evil in all of our pursuits, however noble. As a result, Chavah is told that bringing a baby into this world will involve not only life, but also pain. Adam is told that bringing food from the earth will involve not only life, but also pain. And serving our nation, too, involves both life and pain. May we soon know a day when we will return to the Tree of Life, when the sin of the Golden Calf will at last be expunged, when לא ישא גוי אל גוי חרב ולא ילמדו עוד מלחמה – when nation will not raise sword against nation and no longer will they study war, when instead of מלאה הארץ חמס a land filled with chamas, we will have מלאה הארץ דעה את ד' כמים לים מכסים, a land filled with knowledge of G-d, as the sea is filled with water.